Despite the name, he's a solid conjurer. Completely replaces Nexus-Champion Saraad in my decks. He usually only got 1 draw, and it was a lot more random than with this guy. It also cost 7 mana with him. This card is great in comparison. This card is so much better than expected, makes me wonder if an "Ethereal Summoner" or similar minion that lets you discover a minion would also be good. This card is AMAZING in arena! Always gives me what I want. Just had the most satisfying result against a Reno Lock while using Kripp's Fat Mage with this card: He was already in the fatigue phase, picked an Effigy from the discover effect, and got a Fel Reaver. He had no more cards left, so there were no drawbacks whatsoever to the Reaver. Needless to say, I'm now in love with this card. I've been using this in a pseudo-aggro/mid-range hybrid and it is absolutely unreal. With good early game presence, the opponent's methods of easily dealing with its measly health are often exhausted, and its 6 attack makes it very powerful for a turn 5 drop and especially for aggro-ish decks. But that discover ability, man, that discover ability. Somehow it always turns the game around for me. Even when the opponent has a sizeable lead, there is always some pick available that allows me to even the game. 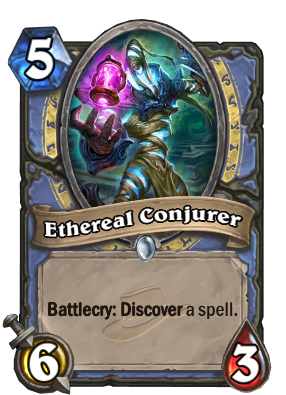 I don't think this card would be as good in any other class because Mage has so many great spell choices. This is a very, very strong card. Due to its stat allocation, I didn't expect this thing to work as well (or be competitive at all, really) in control-ish decks, so I am very happy to see in these comments I was wrong. This isn't a card for tempo, it's more about control. That's how I use it. He's in my oddity freeze deck and my oddity control deck. Not only does he give you another spell card (or two with Brann Bronzebeard) but 6 atk isn't anything to sneeze at so it has to be dealt with. Couple this with dupe or echo and it becomes a big obstacle. I don't like that mages get everything for arena. MAGES ARE OP IN ARENA!!! This guy should not be a COMMON!!!!!!!!! It ruins arena balance even more. MAKE IT STOP! Paladin is still more OP in Arena. I love this guy, he's both won me the game and saved me from aggro. Favorite card from the set. Will see constructed play and Arena. Top tier card. Insane value, insane versatility and card advantage for a very small price. Feels like this could easily replace Azure Drake in tempo. My first thought, tested it and: YES. This card works wonders. Even though the body with 3 HP is weaker you will get a spell and the chances to draw a bad spell is not that high. If you have flamewakers you can be lucky and get MEs or AM, Pyro for the next turn for lethal, situational good secrets...I love this card! Been trying this card and I like it.. don't know why people say a 6\3 body is bad for 5.. it's actually very good tempo plus don't forget how much a draw card is worth (Easy exemple 1Cost card with battlecry draw one card has a bad 1/1 body) This one is a SUPER DRAW ONE CARD you choose one spell from the best spell class... Don't know about you guys but this is in my deck for sure. added it to my grinder deck and while I've only been playing it for an hour, the ability to gain more card draw, board clear, direct removal on command completely destroys any other normal draw a card card. Not to mention it doesn't effect the reno jackson effect since its all done in your hand not your deck. I guarantee this card will be one of the best cards to come out on thursday.